Welcome to the Doubletree Club Hotel San Diego - a full-service, boutique style hotel in the heart of sunny San Diego, California.Doubletree Club Hotel San Diego offers a $6 million enhanced guest experience, featuring brand new guest rooms, fitness center, public space and meeting space. This Hotel Circle/Mission Valley property is at the gateway to San Diego and the Mission Valley area and it's been reinvented to provide you with a more comfortable San Diego stay.The Doubletree Club Hotel San Diego is located just off I-8 and I-5 freeways, minutes from Downtown San Diego, San Diego Convention Center, USD, UCSD and beautiful San Diego beaches. San Diego International Airport (SAN) is just five minutes away. 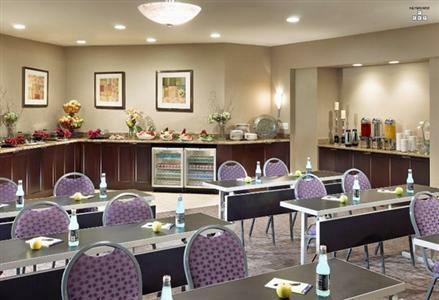 The Doubletree is also one mile from the upscale Fashion Valley Mall and Old Town San Diego shops and restaurants. Pure California, the Doubletree Club Hotel San Diego offers spectacular expansive views of Mission Valley, Riverside Golf Course, USD and Presidio Park (California's first mission), friendly service and an unbeatable location with easy access to San Diego freeways and Southern California's most popular destinations including Gaslamp Quarter, SeaWorld, World Famous San Diego Zoo, and Balboa Park. Our luxurious, brand new guest rooms include all the comforts of home and must-have amenities for business and leisure traveler alike.Doubletree Club Hotel San Diego Features 10,000 square feet of flexible meeting and event space (w/ natural light), 15 brand new kids suites with custom-designed bunk beds, Panini Grill & Bar serving California cuisine and featuring Starbucks coffee, Outdoor heated pool and whirlpool, Beautiful terrace courtyard with a relaxing fire pit, Complimentary wireless high-speed Internet access in public areas, Covered self-parking, State-of-the-art fitness center featuring Precor equipment, Riverwalk Golf Course nearby, Shopping, dining, sightseeing all nearby, Gift shop, Business center, Two complimentary Club Rooms (accommodates up to five people each).Doubletree Club Hotel San Diego Amenities 219 brand new Renovated Rooms with private balconies and panoramic views, Accommodations offer one king or two queen beds with plush, luxurious Sweet Dreams bedding, Oversized, ergonomic work desk with ergonomic chair and desk level electrical and data port outlets, Coffee maker with complimentary coffee from Wolfgang Puck, Two speaker phones with voicemail and data ports, Refrigerators in every room, Spa luxury bathrooms with granite counter tops, all new tiling and fixtures and aromatherapy bath amenities, USA Today each weekday morning, Iron and ironing boardWhen you are ready to explore San Diego, the Doubletree Club Hotel San Diego is just minutes from several of the city's bustling entertainment centers. Head downtown for conventions, art, music or a game at PETCO Park, home of the San Diego Padres and many other sporting events and concerts. You can enjoy the world famous Gaslamp Quarter or the Seaport Village on San Diego's Embarcadero, or explore your wild side at the San Diego Zoo and SeaWorld.Hilton HHonors members can earn both points and miles for every qualifying stay at the Doubletree Club Hotel San Diego. Click here for more information on the award-winning Hilton HHonors Program.Whatever your reason for visiting San Diego, the Doubletree Club Hotel San Diego looks forward to welcoming you with our very special, warm chocolate-chip cookie at check-in.